This revised and expanded edition emphasizes the basic concepts underlying the analysis and design of all discrete and integrated circuits. Contains an extensive treatment of semiconductor fundamentals; new material on power supplies and Schottky barrier diodes including useful models for diodes in avalanche breakdown and cutoff; a more accurate linear model for the biopolar transistor; the concept of the Early voltage; and an improved account of frequency response. Features two new chapters devoted to the operational amplifier and its specifications and the use of the op-amp, with a number of its important applications such as voltage references, comparators, differentiators and intergrators. Many of the examples and all of the problems are new. 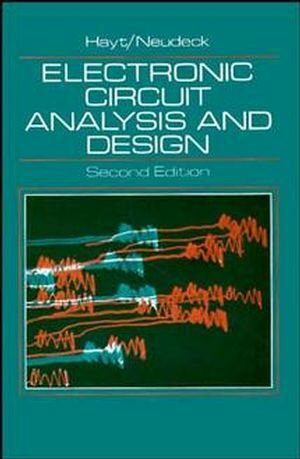 William H. Hayt and Gerold W. Neudeck are the authors of Electronic Circuit Analysis and Design, 2nd Edition, published by Wiley. Diodes, Diode Models, and Applications. Designing for a Stable Operating Point. Single-Stage Amplifiers at Low and High Frequencies.